I’ve realised that when I cook salmon, there’s only really one way I cook – with chilli, coconut oil and a bit of garlic. Often with brown rice and broccoli. So it was time for a change. A change to white fish. Here’s my hastily put together (but it works!) 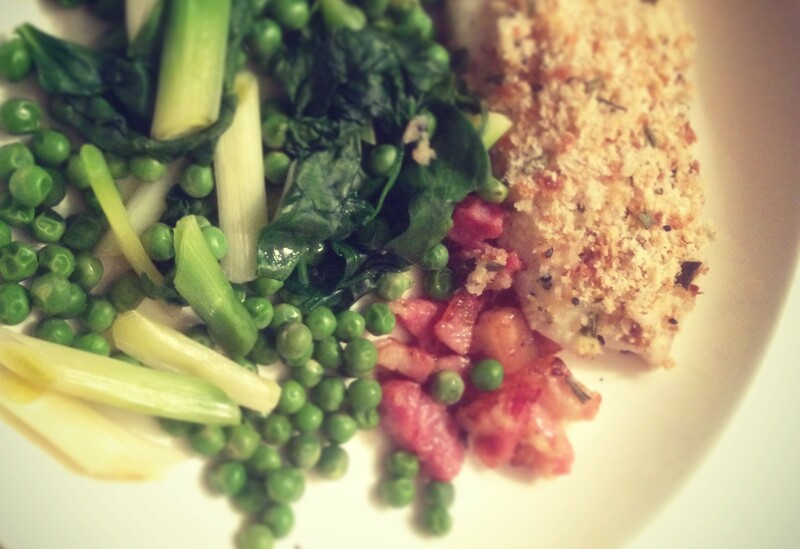 recipe for Healthy Baked Haddock with greens. The bacon goes superbly, if I do say so myself and it’s the perfect healthy meal that doesn’t compromise on taste. Place the haddock fillets on a layer of foil on a baking tray. In a mug, mix the breadcrumbs, rosemary and garlic well. Using a teaspoon, heap the mixture evenly onto each fillet, patting down with the back of the teaspoon. Add the bacon, lardons or pancetta around the outside of the haddock fillets in the tray. Bake for 20 minutes at 180′ or until the fish flakes when pressed. Serve with a mixture of green vegetables – peas, broccoli, leeks, courgettes, spinach etc. And a smile. What’s so great about white fish? High in Protein – aids with cell growth. Rich in B vitamins – good for hair, skin, immune system. Can also increase your metabolism. Rich in Selenium – has similar to the benefits of vitamin B. Can help prevent problems related to your thyroid. Low in fat – haddock is properly ‘clean’ fish. *I grated some of Gail’s Bakery Rosemary & Potato bread. Awesome.